A correction to yesterdays post - DC3 ZK-AMY in fact departed Woodbourne on track north heading to Palmerston North for servicing at Fieldair. A busy day for Life Flight Trust today with ZK-LFT in Woodbourne during the early part of the morning and ZK-NSS at Nelson in the later part of the morning. LFT operated to and from Wellington as LFT01 while NSS operated to and from Auckland as LFT02. Two of this mornings movements were also noted during the afternoon, making for a busy day of medical transfers. Flight Corp Piper PA-34-200T ZK-TSD arrived back into Woodbourne from Nelson as FCP06 before heading for home later in the afternoon. New Zealand Flying Doctors Cessna 441 ZK-NFD was spotted heading to Nelson from Christchurch. Also noted flying out of Woodbourne was RNZAF Orion NZ4203 which departed for parts north, assumed to be its home at Whenuapai. 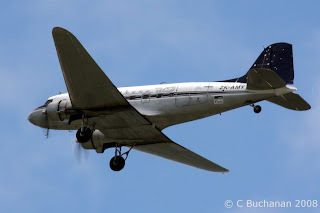 Departing Woodbourne at lunchtime was Southern DC3 Trust DC3 ZK-AMY on return to her home base in Canterbury. First up this morning was a single diversion into Woodbourne due to fog in Christchurch. An Air Nelson Q300 operating NZ8479 NPE-CHC diverted to Woodbourne. It departed later in the morning to Christchurch as NZ8961. CGE12 a Cessna 172R once again operated a training flight in the Woodbourne zone operating MK-WB-MK. It was noticed making approaches to Wodbourne, carrying out missed approaches and holding at the Woodbourne hold point. A singe noteable RNZAF arrival into Woodbourne today was P3B Orion believed to be NZ4203. This is the first noted Orion arrival in a long time. Also noted in the area was Piper Malibu N9099Z operating from its Nelson base to New Plymouth. A few medical flights into Woodbourne today with the first being Garden City Helicopters/New Zealand Flying Doctors Cessna 441 ZK-NFD operating CHC-BHE-CHC. The star of the day was Southern DC3 Trust DC3C-S1C3G ZK-AMY 'Lady Jane' on her South Island, Legend of the Skies - Heartland Tour. She arrived during the morning and then operated several sight seeing flights during the day from Woodbourne. Wow its November already where has the year gone? Congratulations to New Zealanders for getting out and voting yesterday, and to the parties that will form the next government. Lets hope they can sort out the mess with the "sale" of the Skyhawk fleet, and the purchase of the new fleets for the Air Force. Also operating from WN was Vincent Aviation Beech 1900D ZK-VAB which was noted making the approach to WB then continuing up the Wairau Valley for Training flights. Another aircraft on training was a Cessna 172R of Nelson Aviation College, this was noted operating MK-WB and then in and around the WB and OM circuts and the WB control zone. Also noted flying in the area was Piper PA-46-310P Malibu ZK-MBU operating NS-TG.